I reckon this is about the perfect eBay record listing. Everything you need to know in order to put your value the record and decide whether you want it. Not passing off a reissue as an original, all the run-out stamps clearly identified and an unambiguous statement of its original pressing status. Clear grading detailed description of any surface damage, for example, 1″ long barely feelable scratch on Track 1″. No wriggle–room for “not as described”, but in return you get to know in advance exactly what to expect. Pictures of front and back cover, and both labels. Good sharp properly lit photos with good colour fidelity. The only improvement could be the exclusive LJC all-in-one view of the run-out and the labels. Pity it is a Buy-it-Now rather than an Auction, but that’s the sellers choice., and up to you. He is a premium price record seller – most sellers haven’t to need or time to be this thorough with run of the mill rock and pop, but this the standard of information to aim for. Pity Ebay don’t show potential record sellers this example of best practice. It would save everyone a load of aggravation. 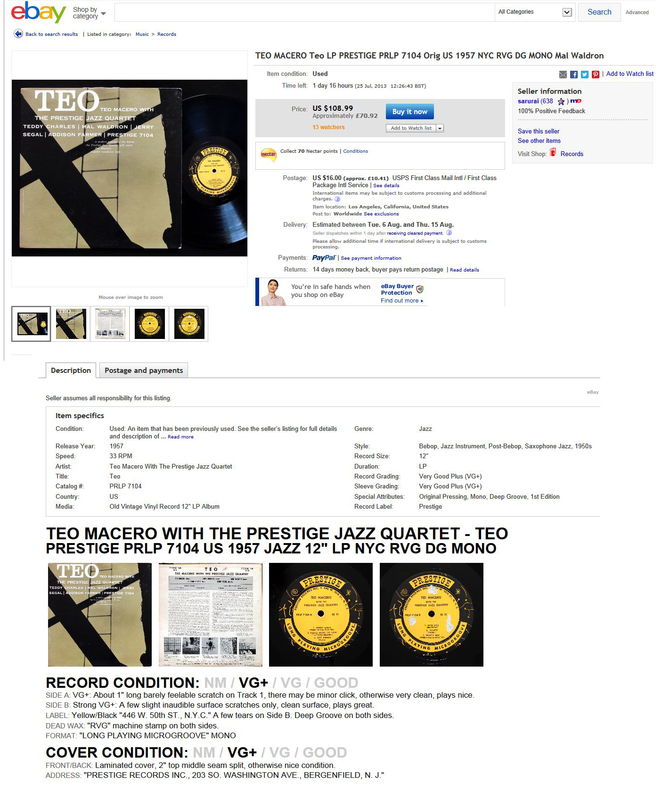 Here are two real life examples of Ebay seller photos -of the record label. The picture on the left devotes 95% of the picture area to useless information: 50% of space to a white sheet, 45% of space to confirm, yes, its a black vinyl record exactly like every other one on the planet, and 5% to the information you want to see, the label, too small to be legible, and at 45 degrees. The seller on the right understands what the buyer wants to know and you can read it easily as it is horizontally level, not at an angle or viewed sideways mounted on a turntable . Always read the label. The right picture is 100% usable information about the record. It confirms the copy is a Jazzland US stereo issue, has the dates of recording legible and the artists names, the INC. after the company name indicates it is of later rather than very early manufacture, the full catalogue number in correct format which is sometimes important for fixing date of manufacture, but has no deep groove in the label area, so it is a slightly later reissue. Yet countless times I see pictures like that on the left. Yes, it’s a record, I know what one of those looks like. It also tells me the seller does not know what he is doing, which is much more worrying. The only elements that would make this listing better (and thus “perfect” IMO) are *definitely* audio samples, preferably of the inner grooves of each side, and the weight of the vinyl is always nice to know. I find it amusing that you used this listing as a sample. I ended up buying this one. I’m not sure I am supposed to say this, but I was glad the seller accepted my unofficial offer. The description was very accurate, and great music, too!